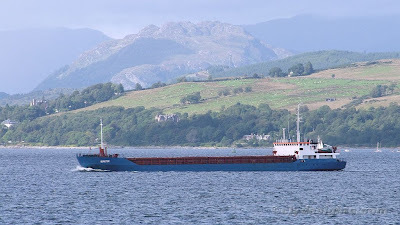 Setting sail from the Clyde with a cargo of scrap metal for Bayonne, Strahlmann's coast BURGTOR was seen as she passed Gourock on Wednesday afternoon. She is one of four sisters, all of which were built in Portugal for Portuguese owners in the late 1980s. BURGTOR, which started her career as PORT LIMA when new in 1989 was subsequently renamed MELLUM nad then LADY LINDA before taking her current name in 2004, when she hoisted the Strahlmann houseflag. She is 87.0 metres in length and has a deadweight of 3,399 tonnes.